Since summer is in full swing for those who live in the northern hemisphere, you would definitely want to go out and have some fun under the sun, obtaining a tan in the process without sitting inside a tanning machine. Well, the Suntracking Beach Chair could be a healthy addition to your home’s lawn, since this folding beach chair is unique in a sense that it can swivel 360º, enabling you to always face the sun without having to go through the hassle of getting up and moving the chair to realign its direction. The swiveling action is made possible thanks to steel ball bearing swhich are sealed by a rubber gasket to keep sand and dirt out. It can recline to three positions, and comes with a removable pillow to offer head and neck support, alongside an integrated canopy that delivers some much needed shade when the heat gets unbearable. Of course, said shade can be flipped behind the chair if you’re going to get a tan. Other materials used in its construction include a woven polyester seat and backrest, anodized aluminum frame, and bamboo armrests for comfortable seating and boasts a capability to withstand prolonged exposure to sun and moisture. For your added comfort, thechair itself boasts an integrated cup holder. 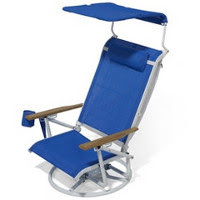 You can pick up the Suntracking Beach Chair for $149.95 from Hammacher.